Wow! There are only ten days until the autumnal equinox! That means fall crafting is in full swing. And I'm so thrilled to be sharing more projects with our exquisite new fall release. Today, I'm focusing on our Fall Leaves Scroll die. I found an arrangement of papers that pleased me. These are very old BoBunny designs. I cut two Fall Leaves Scroll dies from an ochre paper. Here you can see how I cut one of them apart to elongate the pattern. Here is my trick for making dimensional cards like so. I layered those base papers, then used foam dots to bump up the scrolly leaves. I then used the inside of the circle die I had cut my patterned paper from as a stencil. I traced the inside onto thin chipboard. I glued this to the bottom of my circle layer, then added just a couple of foam dots. This saves a ton on mounting foam and also gives substance to the circle layer, so that it doesn't warp in the mail. I finished my card with a handmade flower, loopy bow, and stamped banner. I curled the banner, then mounted for beautiful dimension. I hope you like it and are inspired to give this a try on your own. 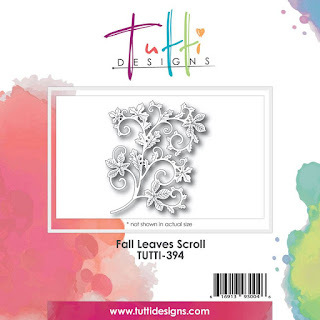 Our Fancy Leaves Scroll is an absolute must have! Visit the shop for the entire fall release. Thanks for visiting today! WOW Absolutely gorgeous and what a clever idea! Thanks so much for sharing this tip and for inspiration! BEAUTIFUL! Wow, this is gorgeous, Autumn! I have some of that BB paper squandered away in my stash. It was one of my favorite collections. Thanks for the tip on saving foam dots too!